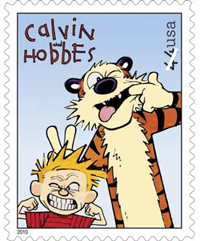 The Lit World’s *Other* Recluse: Calvin & Hobbes Creator Speaks! Bill Watterson breaks a 15-year silence to joke about the death of newspapers. No word on whether he has an iPad. Bill Watterson gave his first interview in 15 years to the Cleveland Plain Dealer yesterday. The reclusive creator of Calvin & Hobbes grew up near Cleveland and has been living there quietly ever since (you might remember the Cleveland Museum of Natural History’s stegosaurus statue from Calvin’s dinosaur visits). Newspapers are dead and dying. Is that a good thing for cartoonists? There’s endless space on the iPad. But what are we losing when comics artists don’t have a system to fight against anymore? When they’re not fenced in by page widths and editorial concerns? All I know is, Watterson doesn’t really care.